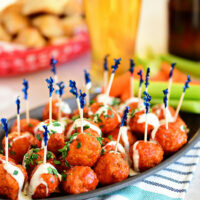 Crowd-pleasing Buffalo Chicken Meatballs with ranch have all the flavors of buffalo hot wings, without the guilt. If you’re a fan of buffalo chicken wings, you’re going to want this finger-lickin’ good recipe. My family has a deep love for anything with buffalo sauce. Crispy Oven Fried Ranch Buffalo Chicken Strips are on regular rotation on our dinner table, and Buffalo Chicken White Chili is a wintertime favorite — especially for football Sundays. If you’re a fan of buffalo chicken wings like my family, you’re going to love these buffalo chicken meatballs! They are a perfect party appetizer, great for Super Bowl parties or even a light dinner when you’re craving hot wings! Buffalo chicken meatballs are made with lean chicken, panko crumbs, ranch dressing mix, a little buffalo wing sauce, spices, and an egg. I use my clean hands to mix it all together. Roll into one inch balls – this is where a cookie scoop comes in handy. After they bake for 15 minutes, toss in buffalo sauce (we like Franks RedHot Wing Sauce). Then put them back in the oven for about 10 minutes. If you’re serving a crowd, you could skip the second visit to the oven, and just place them in a slow cooker and cover with buffalo sauce and cook on low at least 30 minutes before serving. Serve with ranch or blue cheese dressing drizzled on top or on the side for dipping. 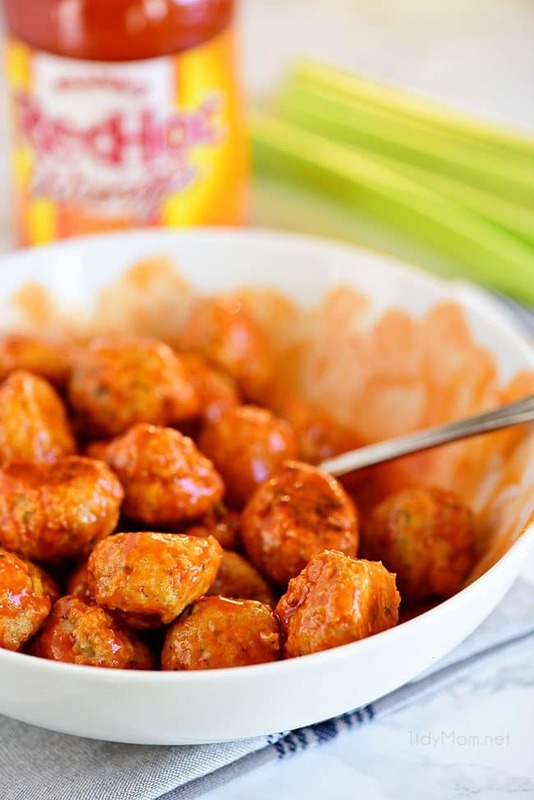 CHECK OUT HOW EASY THIS BUFFALO CHICKEN MEATBALLS RECIPE IS TO MAKE! 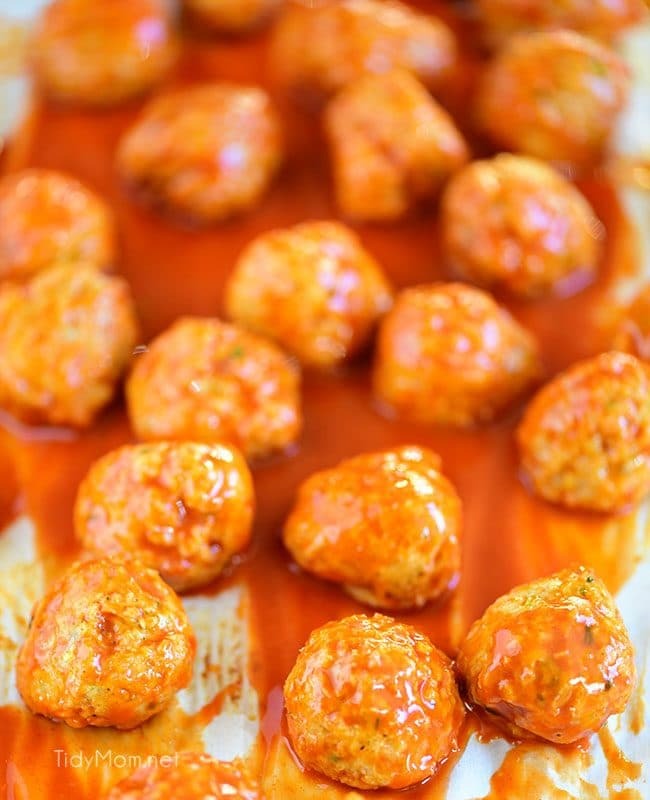 We loved these buffalo chicken meatballs, they really taste just like wings, without the mess and easier on the waistline. 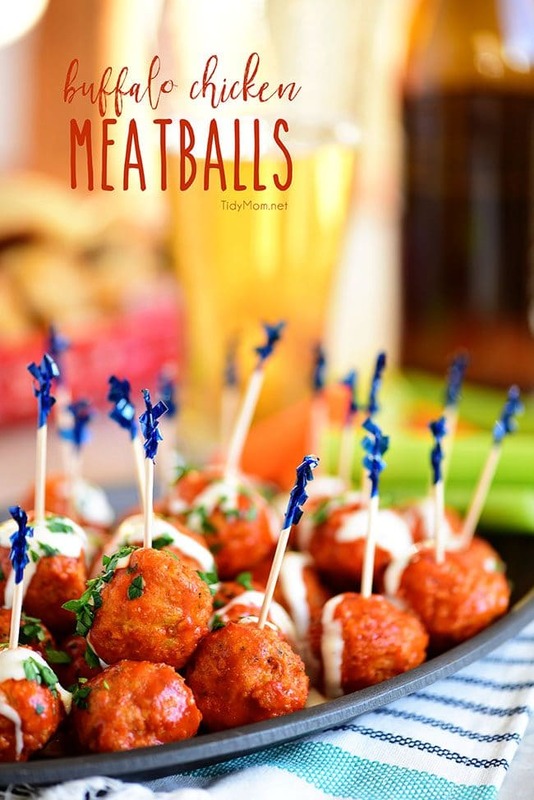 Like this Buffalo Chicken Meatball Recipe? Pin It! 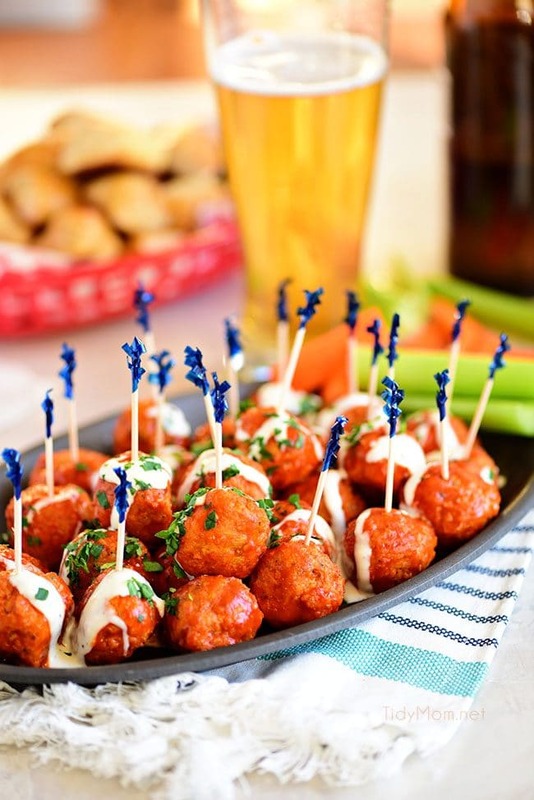 Buffalo Chicken Meatballs with ranch have all the flavors of buffalo hot wings, with out the guilt in this finger-lickin' good appetizer recipe. Preheat oven to 400°. Line a baking sheet pan with parchment paper (or lightly grease). 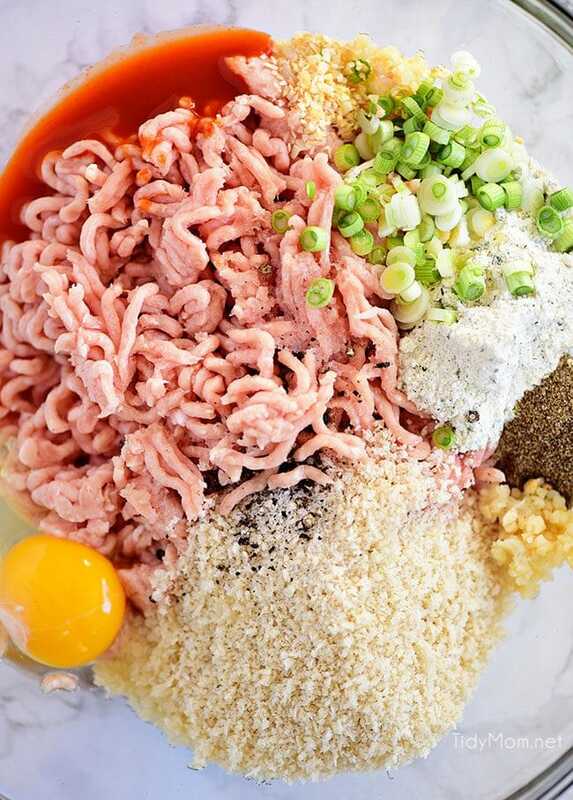 In a large bowl combine ground chicken, bread crumbs, ranch mix, egg, garlic, 1 tablespoon buffalo wing sauce, green onions, celery salt, onion flakes, salt and pepper. 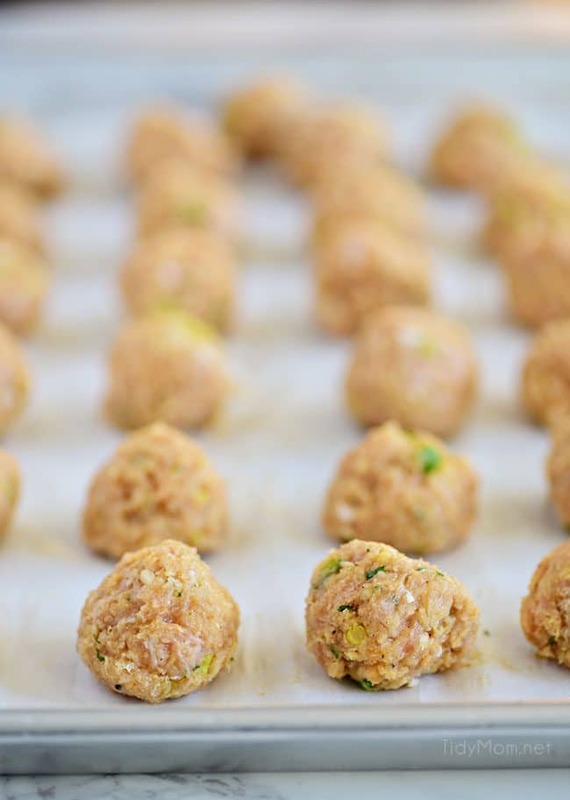 Roll mixture into 1 tablespoon balls and place on prepared baking sheet. Place pan of meatballs in oven for 15 minutes. Remove from oven and let cool 5 minutes on pan. 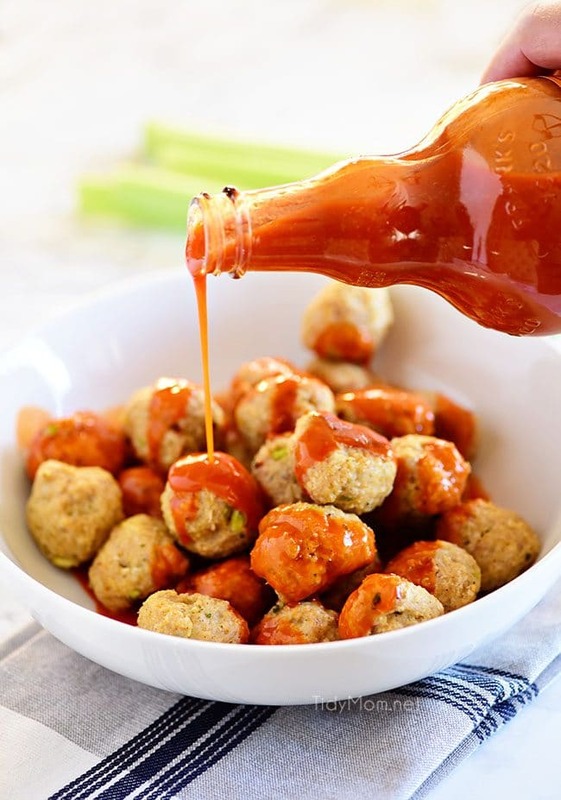 Pour remaining hot wing sauce in a shallow bowl, add meatballs and toss to coat, and place meatballs back on baking pan. Place pan of meatballs back in oven to bake another 10 minutes*. *You could also coat and keep warm in a slow cooker; after baking for initial 15 mintues, place meatballs in a slow cooker and add enough buffalo wing sauce to cover meatballs, heat on low at least 30 minutes before serving.